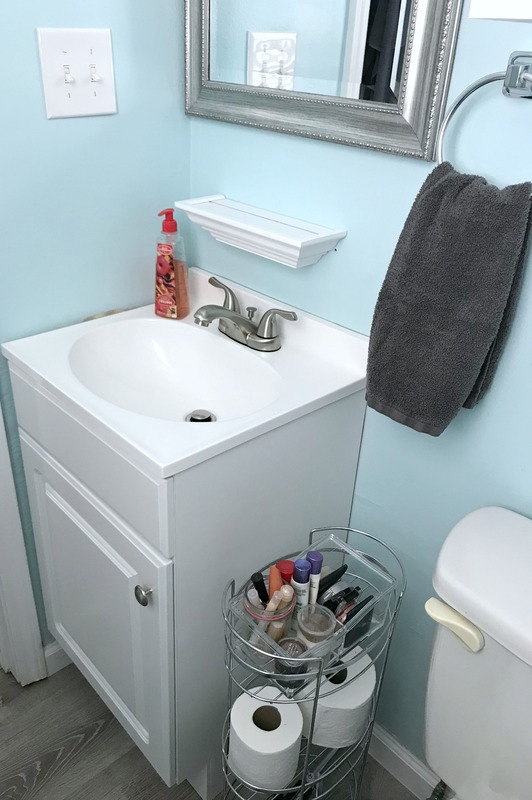 I am so happy to announce that we have completed our bathroom remodel project! We were forced to take on this project due to water damage in our flooring and decided to make a few upgrades while we had the chance. 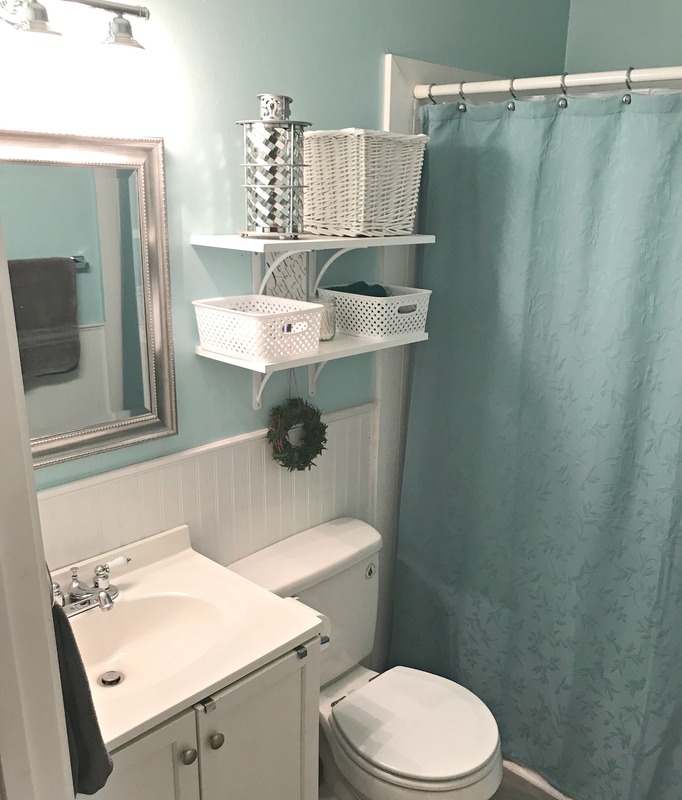 Since we didn’t plan on doing the remodel, I had to be very creative and frugal (not that I wouldn’t have been otherwise) in every area of the project. Are you ready for the reveal? Here it is! Before we made one purchase, Paul and I wrote out a budget for the entire project and estimated we’d need $775 for materials. Paul added in a $300 buffer for unexpected expenses, but I determined to stay as close to $775 as possible. 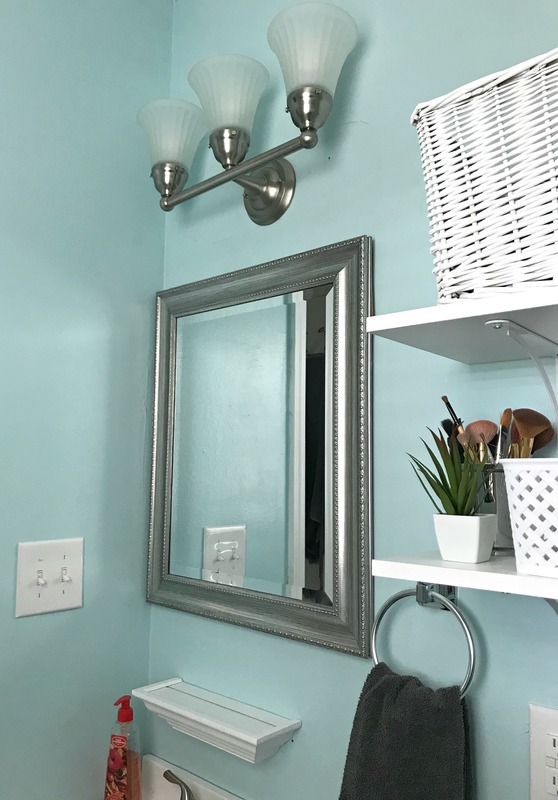 I chose basic hardware and took my time shopping for mirrors and accessories. It was worth it to come in under budget! Nice work and you show how without spending a lot of money you can make significant change. So pretty!! 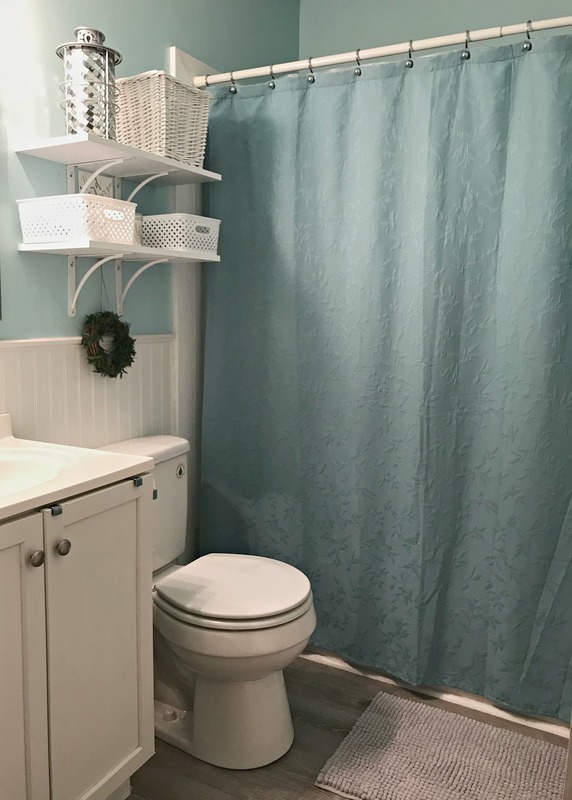 I just love the colors and that you did both bathrooms the same. Smart thinking! 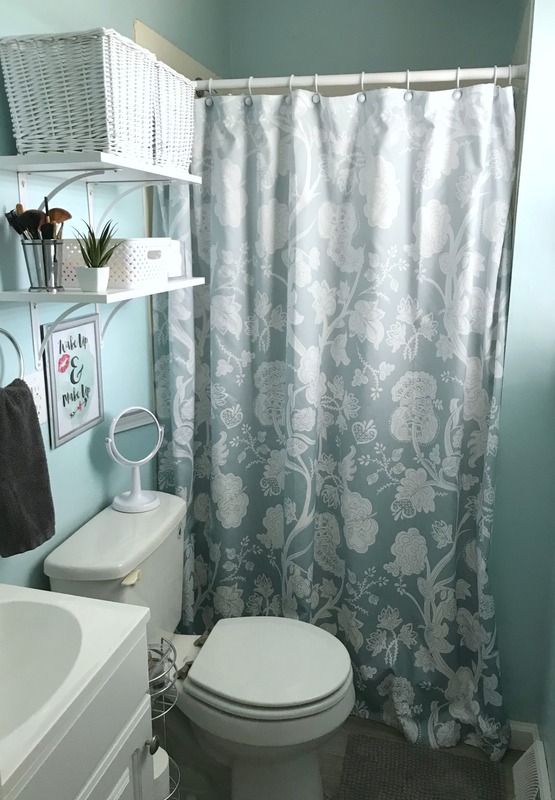 Your master shower curtain is so pretty. It looks brand new and goes perfectly in that space. 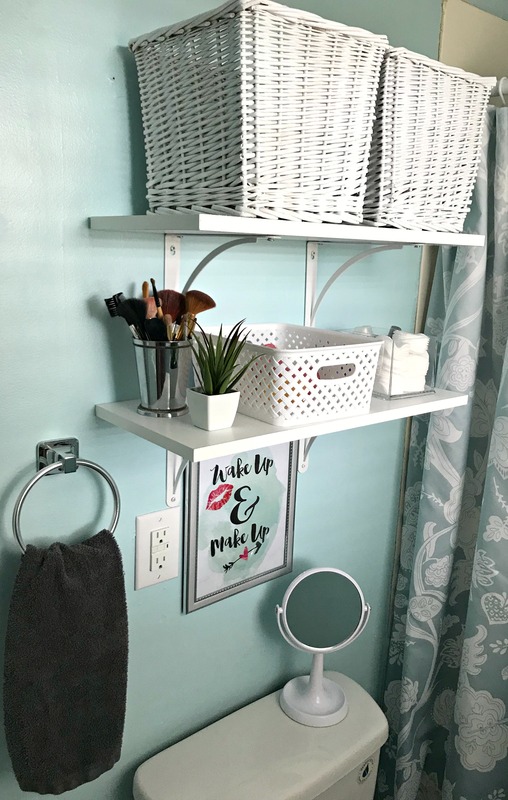 Love your white baskets, white shelves and your flooring is really pretty. 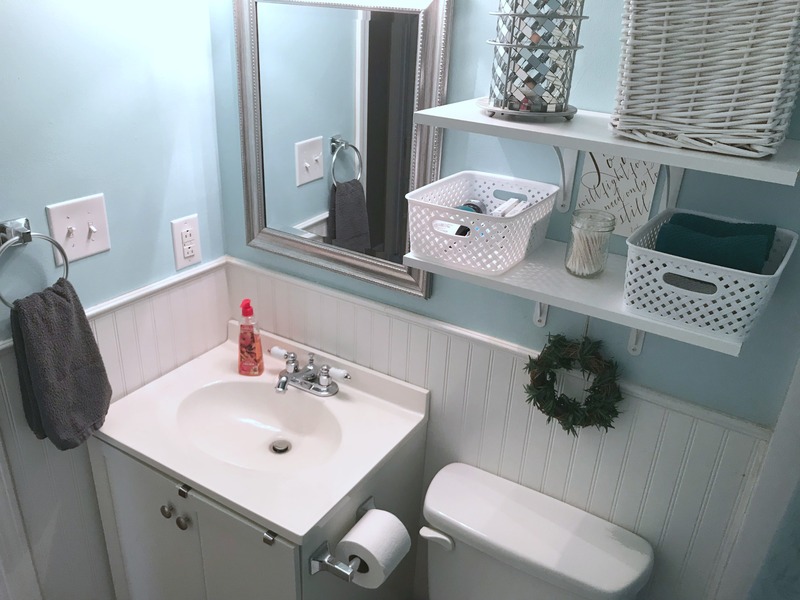 We did quick updates to two bathrooms by swapping out the mirrors at our house. It really does make a huge impact to have pretty mirror. Great job and I’m glad you get to enjoy your pretty bathrooms. 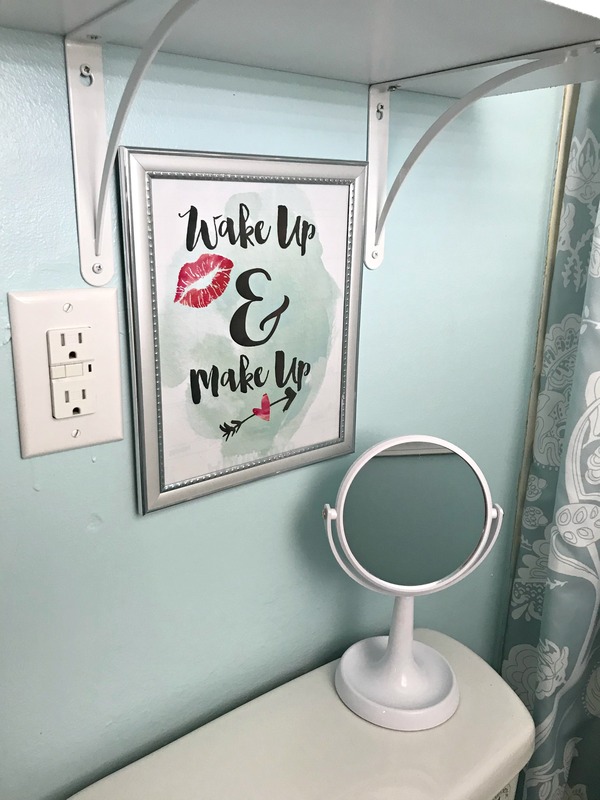 I remembered how much impact your bathroom mirror upgrade brought to that room – that was my inspiration for the mirrors I bought for ours! 🙂 Since the bathrooms are pretty small (and close together) it just made sense to have them matching. It was definitely easier and cheaper! Looks fantastic – you guys did a great job! I know you are enjoying both rooms every day! Thank you, Jennifer! Yes we are definitely enjoying them! Thank you so much, Bekah! Both bathrooms are really fresh and updated! Looks so nice! So lovely Whitney. I like your color choices. Wow, I can’t believe the difference! Great color choice, as well as all the accessories! The project turned out beautifully! Good job! What a great job! I love your colors also…have a very similar wall paint in our master bath! Thank you for your painting advice and helpful decor ideas along the way! It turned out great! Love the color of the walls. We need to have tile put down in our our stairs bathrooms, and I’ve been putting it off. Thank you! Ideally, I would have gone with tile instead of laminate…but I’m happy with how it turned out!